The Inspector General, Ibrahim Idris, has rewarded 27 policemen with a special promotion to their next ranks, for their gallantry in the operation that led to the killing of dreaded kidnap kingpin, Henry Chibueze, alias Vampire. Meanwhile, three suspects, including a 23-year-old woman, Aisha Bature, who were said to be members of a kidnapping and robbery gang terrorising Kaduna and Kastina states, have been arrested by operatives of the Inspector General of Police Special Intelligence Response Team, IRT, for robbing Kastina State Governor’s son, Ibrahim Bello Masari. 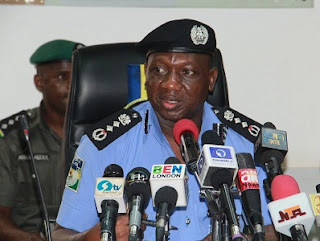 IGP-Idris Vanguard gathered that the Inspector General, Ibrahim Idris, who received a complaint on the incident, deployed his IRT operatives to track down the suspects. It was gathered that one of the suspects, Nuhu Fulani, was arrested by the operatives in possession of a Samsung S6 mobile phone that was stolen from the governor’s son. Nuhu Fulani, it was gathered, led the operatives to the home of one of his colleagues, Yahaya Mohammed, where a locally-made gun was recovered. Vanguard further gathered that the gang leader, Bature, fled when he sighted the police and his wife Aisha hid the gang’s AK-47 rifle with a fully-loaded magazine in the toilet. On the promotion of officers, the policemen, who were attached to the IRT and the Imo State Anti-Kidnapping units, were deployed to Imo State by the IG to track down the Vampire after he was rescued from the Owerri High Court on January 27, by members of his gang.